A few months ago, I started compiling a list of Cold War era (1945-1990s), American men’s dress shoe manufacturers and brands. This was a period of consolidation, contraction and eventually collapse for the US shoe industry. I was hoping to add a paragraph about each with a logo or two. It was intended to help myself and the many readers who send me emails asking me, “Have you heard of this brand?”. Well, this project was a bit too ambitious given the huge number of companies and brands. So here is the list as it stands now. I will add content to it as I learn more. I am sure I missed a number of brands and manufacturers. There are probably mistakes too. Please leave a comment to augment or correct any of the information below. Allen Edmonds – Belgium, Wisconsin in 1922. Still making shoes in USA. Sold to Caleres in 2016. Banister– Premium shoe brand founded in 1845 in South Weymouth Mass. Purchased by Stetson in 1953 or 1954. Later purchased by Freeman. Bates – Founded in Webster Mass 1885. Purchased by Wolverine Worldwide in 1969. Prominent military footwear producer. Big user of porometic/corfam leather. Company website claims Bates invented the long wing in 1919. Bostonian – Founded in 1899 as Commonwealth Shoe Co, Whitman MA. Purchased by Kayser Roth Corporation. (date unknown). Purchased by Clarks in 1979. Shoes made at Hanover factory after purchase. Shoes no longer produced in USA. Boyd’s – St Louis MO based retailer. Out of business in 1995. Produced a premium line of shoes branded Threadneedle Street. Brown Shoe Co – Founded in 1878 in St Louis. Ended US Shoe production in 1995. Company changed name to Caleres in 2015. Dexter – founded in Dexter Maine in 1958. Sold to Berkshire Hathaway in 1993. Ended US Production in 2001. Part of HH Brown Co.
Douglas Shoes– Brockton Mass. Founded in 1876, closed in 1950. Dr. Scholl’s– founded in Chicago in 1906. Focused on orthotics. Brand sold to Schering-Plough in 1968. Name owned by Caleres. E.E. Taylor Corp – Freeport Maine. Closed in 1975. E.T. Wright – Rockland Mass. Founded in 1876 by Elwin Temple Wright. Name purchased by Mason in 1998. Eastland – Freeport, Maine. Founded in 1955. Still producing some shoes in USA. Etonic – Charles A Eaton Co, Brockton Mass. Founded in 1876. Primarily a premium golf shoe producer after 1945. USA production ended in 1999. Flagg Bros – Genesco brands. Founded? Florsheim – Founded in Chicago in 1892. International Shoe Co purchase in 1952. Apollo Group purchased brand in 1991 and spun out as a separate company in 1992. Purchase by Weyco out of bankruptcy in 2002. USA production ended in early 2000s. Foot-So-Port – Founded in 1927 Oconomowoc, Wis as Musebeck shoe Co. Owned by QF&C after 1991. Fire destroyed factory on Sep 18, 1994. Continued for a few more years until closing. Frye – Founded in 1863 in Marlboro, Massachusetts. Sold in 1998 and changed owners multiple times since then. Most manufacturing moved offshore but still produces a collection of made in USA shoes and boots. G.R. Kinney Company – Founded in New York City in 1894. Sold to Brown Shoe Co and then later Woolworth. Hanover – Founded in Hanover Pennsylvania in 1899. Purchased by Clarks in 1978. USA production ended in 1996. Johnston & Murphy – Founded in Newark NJ in 1850. Purchased by General Shoe Corporation in 1951. Outsourced most shoe production by 2002 but still produces a line of shoes in USA. London Character – New York based chain. Closed in the 1970s? Mason – Chippewa Falls Wisconsin. Ended USA production in 2003. Mid-States Shoe Co – Milwaukee Wisconsin. Originally the Walter Booth Shoe Co. Later Shoe Co of America. Modern Shoe Co – St Louis Missouri. Musebeck Shoe Co. – Founded by George Musebeck in 1927 in Oconomowoc, WI. Sold to Thomas Stoll in 1979. Out of business in 1991. Nettleton – Founded in Syracuse NY in 1878 as a premium shoe manufacturer. Sold to Endicott Johnson in 1968. Purchased by Ed Tognoni in Dec 1981. Closed Syracuse factory in 1984. Purchased by United States Shoe Co in Dec 1984 and production moved to Freeman factory in Beloit Wisconsin. Ed Tognoni purchased name in 1990 out of Freeman bankruptcy. Robert Kirk – San Francisco retailer founded in 1939 and sold to Cable Car Clothiers in 1972. Had a line of Alden made shoes under the Robert Kirk brand. Selby Shoe Co – founded in Portsmouth, Ohio in 1879. Closed in 1957. Used the Arch Preserver tag before Wright. 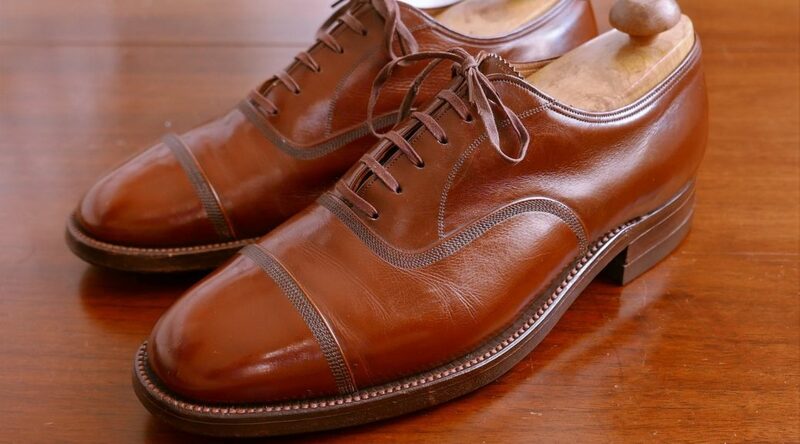 Sibley’s Shoes – Detroit based footwear chain. Out of business in 2003. Produced a line of shoes with the store name. Stetson Shoe – Founded in 1885 in South Weymouth Mass. Stopped production in 1969 and licensed the name to Bostonian. Production ended in 1973. Name sold to Kayser-Roth. Taylor Made – EE Taylor Corp brand. Unrelated to the current Taylor Made golf company (not 100%). Thurmont Shoe Co – Thurmont, Maryland. United States Shoe Co – Founded in 1931 in Cincinnati. Bankrupt in the early 1990s. William Hahn Shoe – In house shoe line for Hahn’s Shoes, a Washington DC based shoe retailer. Retailer started in 1876 and purchased by US Shoe Corp in 1962. Sold to a private partnership in 1992 and and bankrupt in 1995. Williams Shoe – Portsmouth, Ohio. Economy shoe maker. Closed in 1976. JP Smith seems to have been absorbed by EE Taylor around the 1950s. thanks for the info. I am travelling but will review this soon. In my survey, FSP factory fire broke out on Sep 18,1994 (Sunday). After the fire, the company declined as you described. Another brand missing from your list is John Ward. I own a pair of theirs called “John Ward Mastershoes.” Has to be from the 1940s or ’50s. Came across a pair of Christopher Hayes on eBay. Never heard of them and can’t find any info. I rencenty came across a vintage Thurmont Shoe, long wing derby, made in USA. Haven’t seen this brand before. Appeared to be all leather with the exception of the biltrite rubber heels. Ever heard of Park Place? Shoes indicate made in the USA but I can’t find anything on that brand. I am not familiar with that brand. My great grandfather founded the Freeman Shoe Company in Beloit. Its really neat to see some info still preserved. Disappointingly little is preserved online. Thank you. I have a number of Freeman catalogs from the 50s and 60s. Some great shoes. I will post them online in the future. Own a beautiful pair of 1975 RICO Guard – Aire burgundy long wings that are an Imperial copy. Very heavy duty well made shoe. Brand name file date 2/7/48 to 6/29/78. Does anyone have anything to say, good or bad, about Stuart McGuire? I found a pair of LWBs that looks interesting, but I’m not finding much information about the quality of the brand online. The shoes appear to have a GYW rubber sole, with paint on the bottom to make them look like leather soles. The seller says they’re circa 1960s. In general, they were lower end shoes. Not great. Have you ever heard of Peal & Co exclusively for Brooks Brothers? Also, what do ask the markings in the shoe represent? Should Frye be added to this list? Crosby Square disappeared for several years but is back, although their shoes are produced in Spain. I know that Red Wing is out of your purview, but they are very much in business and have made a big splash with their Heritage line. The cool kids love these reproductions of old work boots (which run $200- 350 (and are beautifully made). My husband is a curmudgeonly builder who wears modern Red Wings and rolls his eyes at this phenomenon, but if it keeps Red Wing strong and making many of its shoes in America, I’m all for it. I really enjoy the blog, keep up the good work! I have an old pair of Jarman Longwings. I know that they changed names multiple times, until now they are known as Genesco, the manufacturers or J&M and others. Is there a way to tell if I have an American made shoe or not?